The Bluffs is a large waterfront community devised of seven separate neighborhoods, built by DiVosta between 1985 and 1994. The Bluffs offers over 1,600 single-family homes, townhomes and condominiums. Spanning from the coastline of the Atlantic Ocean to the Intracoastal Waterway, residential subdivisions within The Bluffs include the North and South Bluffs Ocean, Lakes at the Bluff, Bluff River North, Bluff River, Marina at the Bluffs and Ridge at the Bluffs. Residents enjoy stunning lake or garden views or the magnificent panoramic view of the Atlantic Ocean. Neighborhoods feature swimming pools, tennis courts, basketball courts, trails for biking and jogging and pathways to the beach. 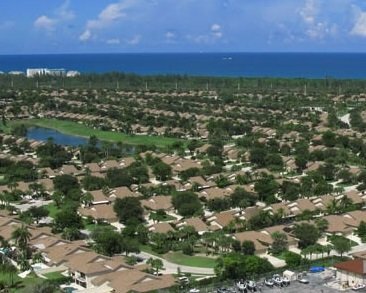 The community’s close proximity to the Juno Beach Pier, Jupiter’s golf courses, shopping centers, and A-rated schools make The Bluffs an ideal place to start your home search. Stunningly renovated River at The Bluffs 3 BR/2 BA home with gorgeous designer upgrades. Gourmet kitchen is accented with Tennessee stacked field stone, granite countertops, premium cabinetry & stainless steel appliances. Master bath is spa-like with quartz countertops, dual vessel sink vanities & frameless glass shower door. 2nd bath is also updated with weathered shiplap accent wall & luxurious marble flooring & shower tile.